Sherlock Holmes: Consulting Detective was first published in 1981. It sits at #56 on BoardGameGeek’s all-time boardgame rankings, even though it’s not a boardgame. In fact, I’m not sure it’s a game at all. It’s really more of a Choose Your Own Adventure story, leading the player to each case solution by the nose. The only game-like feature is counting how many clues you read to solve the case and comparing it to the minimum given by the cluebook for that particular murder. Nonetheless, Asmodee has just re-released the game in a ten-case, standalone expansion called Jack the Ripper & West End Adventures. 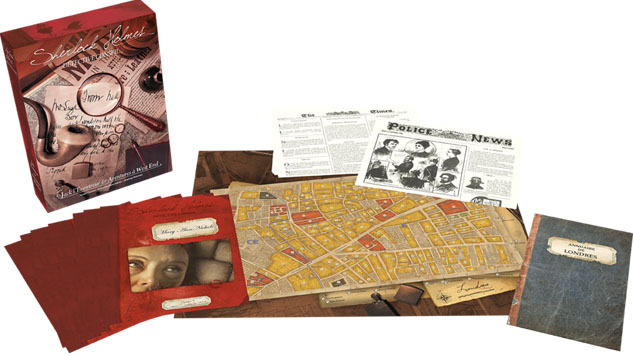 The new version comes with ten casebooks, four of which are a single story arc around Jack the Ripper, the other six standalone cases for players to solve. Each casebook has an introduction and then a series of clues organized by place, while the game has a master directory of addresses, a set of newspapers (one per case, roughly), and a map of London. Players move from clue to clue, deciding which address to visit next – a person’s home, a workplace, Scotland Yard, the coroner’s office, various inns and flophouses – to see if there’s a clue listed under that address. Some clues are useless, many redundant, and only a few truly enlightening for that specific case. The biggest problem with the game is how atrocious the writing is. Arthur Conan Doyle’s prose was erudite and his two main characters very well-defined in speech and manners. The writing in SH:CD is awkward and noticeably less eloquent, almost cloying at times, with so much extraneous detail that it makes sense for the reader to skip over all the physical descriptions or exchanges of pleasantries. If you’ve read any of the original Holmes stories, you’ll immediately recognize how ‘wrong’ the dialogue written here for Holmes and Watson is. The characters are in the public domain now, but that doesn’t excuse this kind of literary inauthenticity. But the structures of the cases are too narrow for it to pose much of a contest; there aren’t multiple paths or theories, just one that you have to hit upon by choosing the right clues from the start, which is more a matter of luck than skill. Each case opens up with an overlong explanation, with a list of suspects or involved parties, so your first step is to visit each of them at their houses or workplaces, after which you’ve accumulated roughly 75% of the minimum number of clues the designers claim are required to solve the case, a flaw that does not take into consideration the indirect path the players might have to take to get there. You’ll bounce somewhat randomly through the first few clues, and eventually stumble on the right one, after which it’s very formulaic to get through the remainder required to solve the case. Great authors of literary mysteries – Conan Doyle, Christie, Sayers – could craft a story where the solution was right there for the discerning reader, but with enough red herrings and other obfuscations to keep it an actual mystery. In SH:CD, I felt like the clues were leading me around by the nose to the solution, and that meant the game really worked only as a solo endeavor. Reading the intro and the clues took way too long, and in nearly all cases, a good clue would only open one door – either giving one detail relevant to the crime or the name of one place for the players to go for the next clue. Even playing one game solo took me a good 45 minutes to reach a point where I was sure I had the correct answer (I did) and all the details to answer the supplemental questions for the case (also yes). And the resolution to that case couldn’t have been more hackneyed: someone did it for the insurance money. The original Sherlock Holmes: Consulting Detective won the Spiel des Jahres award in 1985 for the best game of the year, and Asmodee is promising a reprint of that game and its ten cases later this year. It has a longstanding cult following and I can see a lot of interest online in the upcoming editions. There’s a decent game concept in here somewhere, but without a thorough rewrite both for style and to improve players’ navigation through the clues, this isn’t it.